A tool for building list menus with images. 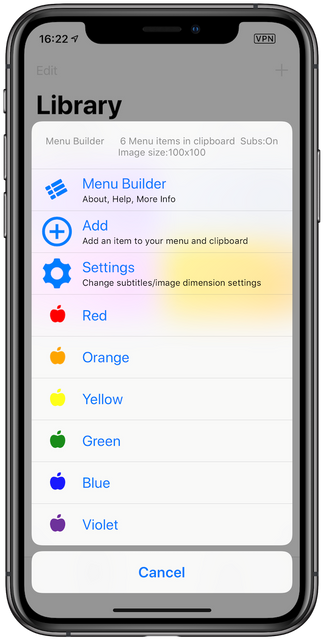 The tool builds some text that you copy into your Shortcut, and then with a few actions you will have a list containing images that can be used as a menu. Fonts are provided by fontawesome.com under CreativeCommons-BY license, please include attribution in your Shortcuts comments when using. 1.5 - April 24, 2019, 7:48 a.m. This is a list with a lot of if statements. Can you make it with menus? No, unfortunately not. Menus can only be used with choose from menu. Would be nice if a Case statement is added to Shortcuts in future. I did a quick and dirty tweak to allow you to bulk create a menu items from image files using the file name for each file as the menu item. Also added the option to save it as a .vcf file as an alternate option rather than to the clipboard as well. https://www.icloud.com/shortcuts/a6882dcaa527483a9841b67ed45bd2a2 I didn't try to refine the workflow, but I think you could merge it in pretty easily. Much less friction than individually if you already have the images ready. Hi I've added a Get Name so that any file name is used as a default for the menu title so its more of a click through if you've done the prep work. How do you deal with ordering, and subtitling? I didn't get that far. How do you change the color of the icons? You can make color icons and choose colours with Quick Icon Maker, or http://fa2png.io is a good online tool where you will also be able to make coloured transparent icons. So you know, your check for updates support will reset the check for updates dictionary because you put Get File "AutoUpdate.json" instead of "AutoUpdateData.json". In the next CFU version there will be a new format for adding cfu support that makes it harder to accidentally overwrite other people's shortcuts there. Thanks for pointing out, but wouldnt this just create a second unsued dictionary, not reset any dictionaries, which wouldnt break updates for everything else. Thats great news, but as per my previous comment its really disappointing that other people can completely break the dictionary for other people with eg malformed dictionary keys I forget the exact reason something like Name/Version was used rather than name/version, more robustness and error checking would be great to see.